Thinking of upgrading your hard drive? No doubt you've got your eye on one of those funky little SSDs everyone's talking about, haven't you? Just before you head over to your favourite online emporium, bear this in mind: Western Digital has refreshed its VelociRaptor lineup of spinning hard disks to include larger capacities, bigger caches and, crucially, reasonable prices. Suddenly, the decision between traditional storage and SSD isn't quite as easy to make. The VelociRaptor range has been around for about a decade now and, until the advent of SSDs, was the storage of choice for the discerning gamer or those who needed workstation speeds for video editing and the like. Just like SSDs, the original VelociRaptors were fast, expensive and lower capacity than regular drives, best used for speeding up particular tasks rather than bulk storage. With flash memory prices falling through the floor and traditional hard drive prices still high after last year's Thai floods, a betting system builder might have put money on the VelociRaptor fading away this year as a superseded technology. Western Digital, however, isn't prepared to let them go the way of their dinosaur forebears. And the combination of new features in the 2012 models makes them very clever lizards indeed. The key thing that separates a VelociRaptor from an ordinary hard drive is spin speed. 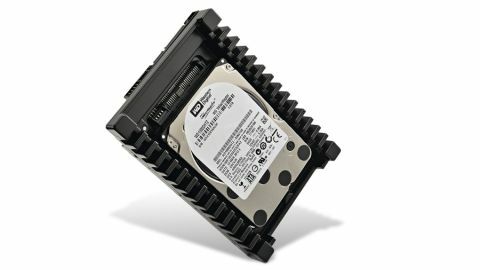 They are high rotation server drives packaged for desktop use. Laptop drives turn beneath the read/write heads at (usually) 5,400rpm, desktop drives whizz round at 7,200rpm, but server drives and VelociRaptors move around their axis at 10,000rpm. That means quicker seeking of information, along with faster read and write speeds. The downside to this is, of course, the exceptional level of engineering required to operate at such velocities, and the resulting cost - which has always been considerably higher than an equivalent 7,200rpm drive. However, there is one other benefit. Drives running at 10,000rpm are - the VelociRaptor excluded - almost only used in demanding professional situations. So there's a five-year guarantee and a good reputation for reliability behind them too - a nice extra for those who worry about investing an SSD because of negative longevity claims. What's new in the latest version of the VelociRaptor? For a start, there's now a three-platter version with a full terabyte of capacity (which is the one you see here). As you'd expect they all come with SATA 6Gbps interfaces too. Perhaps most importantly, however, is that the cache memory size has been doubled from 32MB to a massive 64MB. Alongside that is the move to the more modern 'Advanced Format' for storage, which increases the minimum block size on each platter from 512bytes to 4Kb. The minimum block size is the smallest amount of data that can be written to the hard drive's surface. It means that if you only want to save a file of, say, 12bytes in size you need to use up a whole 512byte block to do so. Raising this size increases the potential for wasted space on the drive - any file smaller than 4Kb will now have room to chill out in - but it also means fewer operations to transfer large amounts of data, making the drive more efficient overall. Finally, the best thing about the VelociRaptor is the price. At £220 per terabyte, it's a bit more than double the price of an equivalent 7,200rpm drive. But compare that with, say, buying a 1TB hard drive at £70 and a £120 128GB SSD for the operating system and essential games and it's suddenly a tempting proposition. If the speed is remotely comparable to that of an SSD, it's a lot less hassle to have one big drive than constantly shifting programs to and from a small SSD. Both of which are more reliable and consistent than using a small cache drive with something like Intel's RST. There is one other thing that's worth noting. It might seem odd, initially, that such a high performance drive is actually built in the smaller 2.5-inch notebook format. Around the edges of this there's a massive, non-removable mounting bracket that takes up a whole 3.5-inch bay. However, this also doubles up as a heatsink, which is vital to reduce the potential for problems that can occur at such high speeds. So it all makes sense in the end. It may be a bit of a sucky conclusion to come to, but comparing the current generation of VelociRaptors to the standard SSD/hard drive set-up leaves us feeling like there's no real winner. That's not a bad thing - the fact that Western Digital's premium drives are competitive at all is a bit surprising - but it does essentially leave the choice down to you. As far as we're concerned, either option is equally appealing. Here's what we found when we tested. Seagate's 750GB drive performed well in circumstances where data could be cached onto the SSD through repetitive testing, but really struggled with the random 4K read and writes in CrystalMark and other places where it was reliant on the 5,400rpm HDD. That's what we expected, and it's no surprise that the VelociRaptor is a much better performer all round than this popular hybrid. It's a bit more expensive, but the consistent performance more than outweighs the one advantage the Seagate has - when it's looking for data in its SSD portion, seek times are less than one millisecond. The XT is also a fair representation of what happens if you use a system like Intel's Smart Response Technology to use a small SSD as a cache drive. Results can be spectacular, but also unreliable. Up against the M3 Pro, however, things get trickier. Sure, the M3 Pro is much faster in every test, but for everything other than handling lots of very small files in random sequences, the VelociRaptor is close enough that the lower cost (the M3 Pro will cost around £250), simplicity of use and larger space offset the disadvantages, in our opinion. Having gone that far and committed to the VelociRaptor, though, it seems almost churlish not to add a second one and build a 2TB RAID array from them. You'll need that much space at some point, and investing up front will give you performance which is - in some cases - even better than an SSD. In practical uses, the two will feel almost identical. Sure, you'll have just blown over £400 on hard drives, but until you can get 256GB drives for less than £200, economics is on your side. There is one drawback to the VelociRaptors, which might just push things the way of the SSD/slow drive combination. The platters inside the VelociRaptor spin quickly and, as a result, they also make a lot of noise. It's like adding at least one fairly gusty case fan to your system. For us, it's the deciding factor that leaves us sticking with an SSD boot/HDD storage combo for our storage solution of choice, but the VelociRaptors are a valid alternative if you fancy something a bit more unusual.